"If you have a large family or you love to entertain, a 7-piece dining set is probably a better choice if you have the space for it." "The set comes with four chairs and a 35.5” x 35.5” square table, perfect for casual dinner parties." "Made ​of steel and weather-resistant rattan, this set can withstand the elements as effectively as any of its competitors." "The slatted mahogany wood set has a tiki feel and looks fabulous on a patio or poolside." "It fits well in both small and large spaces and works nicely on its own or as an accompaniment to a patio dining set." "The four chairs and round table are made from powder-coated iron, which won’t tarnish or rust throughout the seasons." "This Walker Edison Solid Acacia Wood Set features four pieces that look classy enough to work indoors, but are strong enough to live outside." If you have a large family or you love to entertain, a 7-piece dining set is probably a better choice if you have the space for it. This Better Homes and Gardens Carter Hills Dining Set comes with seating for up to six, so you’ll have more than enough room for all of those al fresco dinner parties. Made from sturdy steel, the slatted table gives off a modern vibe while remaining subtle enough for any taste. The set comes with two swivel chairs and four solid standing chairs, both with maroon polyester cushions that have been treated to withstand the elements. The larger swivel chairs measure 26.38" x 24.53" x 35.04", while the other four run 24.43" x 24.57" x 35.24". The large table is 72” ​x 40” and can support an umbrella. Because this seven-piece set is made from durable steel, it weighs over 200 lbs when it’s delivered, so prepare to have some help on hand for assembly. Anyone who lives to entertain will love this large dining set that will last for years to come. The Brayden Studio Mercer Outdoor Dining Set is a chic, modern woven resin table and chair set that blends with any decor style. The set comes with four chairs and a 35.5” x 35.5” square table, perfect for casual dinner parties. You can choose between a gray and white or black finish, and each piece is made with a steel frame and a weatherproof resin weave. The seats include matching cushions, and the table even has a hole cut out to accommodate an umbrella. The Brayden Studio Mercer set is definitely on the cozy side, so it’s better for smaller patios or balconies or arranged next to a pool. Owners love the contemporary look and say that it’s well worth the hassle of putting it together. If you’re looking for an affordable, simple-but-chic dining set, you can’t go wrong with the Mercer. Interested in reading more reviews? Take a look at our selection of the best patio dining sets. Reviewers say the Goplus set looks far more expensive than it is, noting that it can easily withstand snow, rain and sleet (but as with all furniture, we recommend bringing in the cushions indoors in bad weather). Add a couple bright throw pillows, and voilà! You have a patio set that costs less than a fancy dinner out, and still looks like a million bucks. Want to take your host status to the next level? Enter the outdoor bar set. This Beachcrest Home Twana Bar Set comes with two stools and a bar made from waterproof acacia wood. The slatted mahogany wood set has a tiki feel and looks fabulous on a patio or poolside. The interior of this 43.3" x 39.4" x 16.5" bar has three shelves that can accommodate wine bottles, glasses and your go-to cocktail supplies. The two stools have backs (so they’re still comfortable) and run just about 30” high. Owners say the Twana set is functional, beautiful and doesn’t fade over time outside. Though you’ll have to put it together yourself, reviewers note that it’s easier than most some-assembly-required furniture. 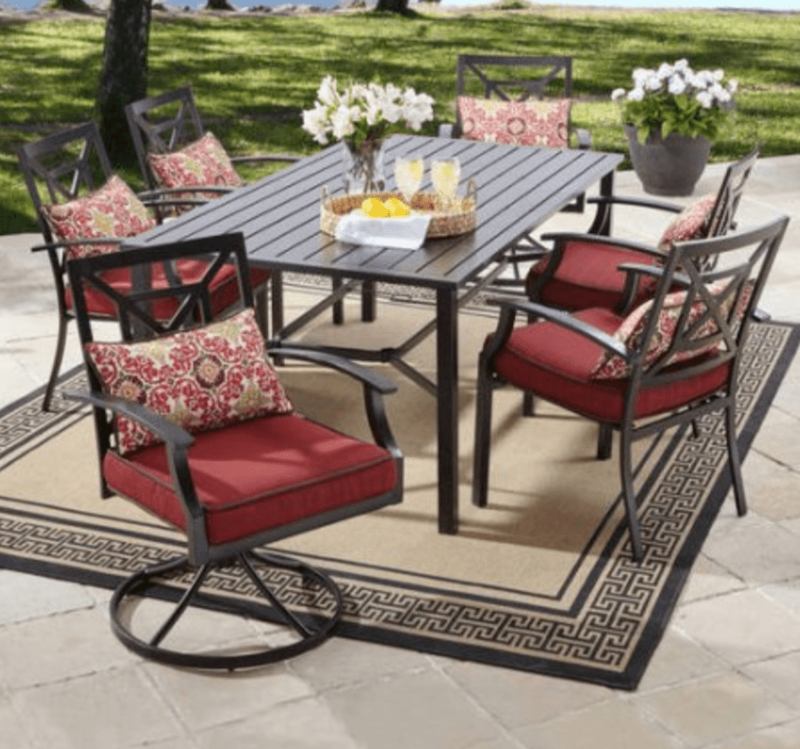 If you want to instantly up your patio game, you can’t go wrong with the Beachcrest Home Twana Set. The Threshold Belvedere 5-Piece Chat Set is a patio furniture set that just screams “come relax!” Made from all-weather wicker (a wicker-like material that is built to withstand the elements) and Scotchgard-treated fabric, the Belvedere set comes with two chairs and two ottomans that tuck underneath, as well as an accent table. The two armchairs measure 24.5” x 32.5” x 25”, and the footstools 16” x 18” (they fit perfectly under the chairs). The accent table is 17.75” x 14” —just large enough to hold a couple of drinks and snacks. Each chair can hold up to about 250 pounds of weight, and reviewers say it’s wide enough for a variety of body shapes and sizes. The Belvedere has rave reviews on Target.com, with owners saying it’s a classy set that looks high-end. It fits well in both small and large spaces and works nicely on its own or as an accompaniment to a patio dining set. Wrought iron has been a popular choice for outdoor furniture for years because it’s durable, weather resistant and classically beautiful. This collection from Better Home and Gardens is a 5-piece patio dining set that’s truly built to last. The four chairs and round table are made from powder-coated iron, which won’t tarnish or rust throughout the seasons. The maroon cushions are water, stain and mildew resistant, and reviewers say they’re soft enough to lounge on all day long. The table is 42” around and 27.25" high, while the chairs are 24.25" x 22.75" x 34.25". As a tip, some owners recommend pairing the set with an extra back cushion for added comfort, and most say assembly is easy even with just one person. Teak and acacia wood are both increasingly popular choices for outdoor furniture. This Walker Edison Solid Acacia Wood Set features four pieces that look classy enough to work indoors, but are strong enough to live outside. It includes a modern-style slatted loveseat, two chairs and a coffee table. The treated acacia wood can stand up to bad weather, but the manufacturer suggests teak oil to keep the appearance looking new. The loveseat measures 37" x 48” x 24” and the chairs 37" x 24" x 28", so it’s a great set for both small patios and larger spaces. All the furniture comes shipped in a single 136-pound box, so this may be a good time to ask that neighbor of yours for a favor. The seats include polyester off-white cushions, which are treated against stains and water. If you want a stylish wood patio set, we guarantee the Walker Edison will garner compliments from all your guests.